This is one of the problem related to my iPhone 3G I had been facing since last 2-3 months, after I jail-broke my iphone second time and upgraded iTunes on my computer, now the iphone data cable had become quite old but it is properly functional after some days of jail-breaking, I started facing this issue on and off. When my iphone even after proper connection with the USB cable with computer, it does not appear with the other drives in My Computer. Suddenly I started facing this issue when my iphone does not show up under my computer with the drives and although iphone is detected in iTunes but does not display as drive in my computer. This is a great problem as I cannot transfer my camera captured pictures on my iphone in the camera roll folder to my computer hard disk. I Googled about the problem and came to know this problem could be due to Mobile Device Driver service installed with apple iTunes is not running or you might need to restart the service to make your iphone show up in windows explorer as driver. This is the crucial service which should be running when you connect your iphone to your computer to transfer pictures. 4. In the “general” tab find the “startup type” drop-down arrow menu and make sure “automatic” is selected. 5. Also see the general tab to check the “service status”. If it does not say “started” then click the start button to start the service and connect your phone again and click apply. 1. Go to My Computer >> Manage and click Device Manager in the left tab. 4. Press F5 to refresh your windows explorer and your Apple iPhone will show up with a camera icon. In my case none of the above method worked, but I want to copy camera taken pictures but there was no way to do it. Even my iphone was recognized with iTunes but it does not allow to transfer the camera pictures 🙁 and then I figured out my own way of transferring images. root >> var >> mobile >> media >> DCIM >> 100APPLE or XXXAPPLE folder. 3. Right click any image and select Copy to PC and select a folder to copy these images, that’s it . This way you can copy the images from iphone camera roll folder when you iphone does not show in my computer. Thanks! DiskAid was the answer for me. I had just about given up on finding a solution for this. Brilliant thanks – but I would really like to see my phone show up in My Computer – none of the suggestions work – in fact the phone does not show up as a portable device – any more ideas? Thanks for the detailed step by step stuff. I tried option 1, nothing. Option 2, well, I don’t have an iPhone option in my portable devices thing in disk manager…wtf? I’ll download diskaid but in the meantime, help! Is this just an ad for DiskAid? I had the same problem but none of these worked for me. After about the 5th time on the phone with Apple Tech support the head tech guy finally figured it out. If you go through your photo roll and there are photos that you DIDN’T take with your iphone such as saving pics from e-mails and mms then make sure you have copies of those somewhere and then delete them off your roll. Since they wasn’t taken by your phone when you go to plug up to your computer it has a hard time reading the phone. I had quite a few of them on there but once I deleted them and plugged my phone up the import option popped up and the icon was on “my computer”. It had worked before with saved pics on there but I guess I just had too many. Definitely worked for me. Thank you!! Not sure if this is just an ad for diskaid or not but just want to say thanks to Cisco for the comment. So far nothing has helped and for the first time in 2 months I can get my photos off my phone (no more slow syncs either!) – lifesaver! Cisco! That was it! Thank you! I deleted some images created in AutoDesk Sketchbook Express and PhotoShop Mobile apps, and the problem was solved. Awesome, this was driving me nuts! Thanks cisco77566 your solution worked a treat. My iphone has only recently not shown up in ‘my computer’, the last 2 photos on my roll were downloaded off an email, after deleting them it all started working again. Unreal, apple should really sort this out. I had this exact same problem. im currently running windows 7. I simply turned my Iphone off while connected to the computer. and turned it back on again! it then showed up. FIXED IT!!!!! There has to be at least one photo in the Camera Roll in order for it to be recognized. take a photo and when you plug it back it it should work. Your advise is brilliant !! 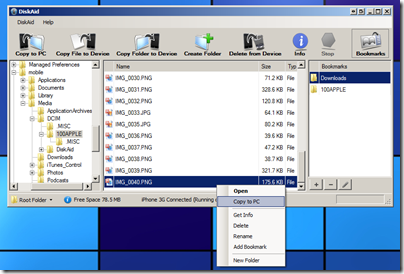 you must have 100 or less pictures in you camera roll for a PC to recognise the device. I don’t agree with you, I have more than 1200 Photos in camera roll of my iPhone and its shows up well every time. Thank you Thank you Thank you for the info this really heip i tried other thing people said to do and this is the only thing that helped !!!!!!! Cisco, it worked like a charm. I have been cussing my computer for hours & that’s all it took. If you’re ever around Raleigh, NC I definitely owe you a beer. Hey people ok ya the methods he give are great but another peoblem for it not working is that u have no photo taking from the camera on the iphone the photo u up from itunes wont leave the apple to pop up!! Option 2 worked for me but it didn’t appear as “Portable devices” in device manager, it was “USB controllers” and it wasn’t “Apple iPhone” it showed up as “Apple mobile device USB Driver”. But aside from that it’s the same. You hit uninstall with it plugged in, unplug/replug and it detects. It also lets you keep the images that you have used PSM on or downloaded from web/email. 1) plug the iPhone into your USB Port. 1a) allow the iPhone to backup and Sync. 11) Click Scan for hardware changes. The iPhone will now be in the device manger as a Portable Device and the import Media dialog should now work. Hi, Unfortunately none of these methods work for me. I have installed DiscAid, but it also does not recognize my iPhone. It says that iTunes is not installed, please install and connect iPhone. I have installed iTunes 9.1.0.xxxx for my 64 bit Windows 7. Kindly let me know if you have any other solution for this. Just take a new picture with your Iphone and then plug it in and that should work.. let me know what happens.. it worked for me..
Just figured out the reason why it didn’t show up. The guy who mentioned talking to the apple guy, you gave me an idea. So I realized the “Apple Iphone” driver wasn’t installed and since that guy figured it had something to do with the camera, I took a picture, and reconnected my iPhone. The result was shocking!!! LOL It installed Apple iPhone driver and windows 7 finally recognized my iphone as removable storage. After several hours of trying, it finally works! Anybody experienced this kind of a problem? How did you solve it? I have a lot of pics from previous synching (when it worked), from apps cameras, and some from webcams. Pliz help. I haven’t synched my iphone for months now. This was an easy fix and it doesn’t require DiskAid or anything else. Basically, go into your device manager, right-click on the device and select Troubleshoot (Windows 7) or update (Other versions). It will update the driver for your device and it then be recognized on your PC. Doesn’t matter how many pictures you have. It doesn’t matter if you take pics from your phone or from another program, and you DON’T have to install a third-party program. Hope it helps. Cisco, you ROCK!! Hours of trying a zillion different methods, and yours was so simple – and worked! device manager to uninstall and re-install. Is it the number of photos transferred from email to camera roll at one time? after you transfer files from the email attachment? if it is received as an attachment via email? without loading it , but it is not saved in camera roll. Anyone knows anything about it? Thank you so much cisco!!! THANK YOU! DiskAid was the answer for me since nothing else worked. Now I have my camera roll on my PC!! tried everything. recognized by itunes, not explorer in vista. method 1:fail, method 2:doesn’t exist. Then tried DiskAid although I think its crazy that Apple hasn’t released a fix for this issue. When googling I found out a lot had the same problem without one good fix. Well, backed up my photos with DiskAid. Then, suddenly i saw a picture I could’nt remember having taken. Deleted it, voila….now it turns up in explorer. Thanks!!!! I struggled all day yesterday and finally came up with a solution. Just delete all the photos in camera roll which you received from mms or email. Then you should find everything works fine. Thanks for the huuuuge help everyone! I was about to chuck my netbook out the window! I installed, uninstalled, booted and rebooted like a mad person and nothing worked until I found you all. Thanks for helping me keep whats left of my sanity! Thank you so much for your article! I had searched and searched for solutions and couldn’t find one until now! what a lifesaver! Awesome! Awesome! Awesome! This worked!! I don’t care if this is an add for DiskAid or not, this fixed my problem. I presume it was a bad or strange image or video in my camera roll as my wife and I swap files all the time. Tried steps one and two with no success. DL’d DiskAid and was finally able to get my photos and videos off my phone. Still couldn’t see my phone in My Computer so I deleted all of the images and videos off of my phone per the tip I read above (about 2.4 G worth). Then, after taking a single photo and rebooting my phone My Computer saw my phone again!! YAYY!!!! Only downside is that I had to pull all of the images off of my phone, but I really needed to clean it up anyway, and this way forced me to get my crap together. Definately my problem, won’t be downloading photos from emails from now on, i’ll leave that til i get to my PC!! WOOOHOOOO!!!!!!!!!!!!!!!!!!!!!!!!!!! THANK YOU CISCO! My phone was showing up no problem but my husband’s iPhone wouldn’t, and on the same computer. I knew it had to be his device. Your solution worked wonderfully! OMG! This is it! I’ve looked for days and nothing worked, not even options 1 & 2 but finally CISCO had the answer I’ve been looking for! All I had to do was delete 4 of the photos saved from emails and my phone was recognized as a camera once again. THANK YOU THANK YOU THANK YOU CISCO!!! thanks man for the info! DiskAid is the best solution. I’m about to be a life saver for all of you. None of these things worked for me, and I wasn’t about to go and start deleting important photos I saved from MMS and emails. Anyways, the solution. iFunBox. Works perfect everytime! Save yourselves a whole lot of hassle. Click download, and save to desktop or folder. On the left side double click your iPhone, then click Camera, then click transfer to PC. Choose where to transfer and you are done. If you have had a logitech webcam installed on your PC it leaves a registry entry that confilcts with the IPhone resulting in the Iphone appearing as a Digital Camera in Device Manager with a yellow exclamation mark. Oh man, thanks Cisco! Saved me ALOT of trouble. After days of research to no avail, #3 worked for me! Mahalo!!! I was having the same problem and it was really confusing me. I did exactly what Francisco did and it worked perfectly. All I did was disconnect the phone from my computer and I took a photo with my phone, closed the camera and then reconnected it, and boom it appeared as a storage/camera device on windows. Getting my videos and pictures as we speak! Thank you Francisco!!! I also was having this problem. Extremely frustrating!! I tried all of the above suggestions and finally had success with Francisco’s suggestion. The confusing thing for me is that I didn’t have any photo’s from emails or mms saved to my phone for it to cause it. do u know how to fix the same problem on a mac? i tried all methods but the only one that worked was the disk aid! Im using window 7, i deleted all my pictures in camera roll. after that randomly tk a pic, then connect ur phone to your computer and The drive will appear in my computer again! iFunBox Works like a magic. I think the problem I had is definitely having too many downloaded photos, but I don’t want to just delete them. 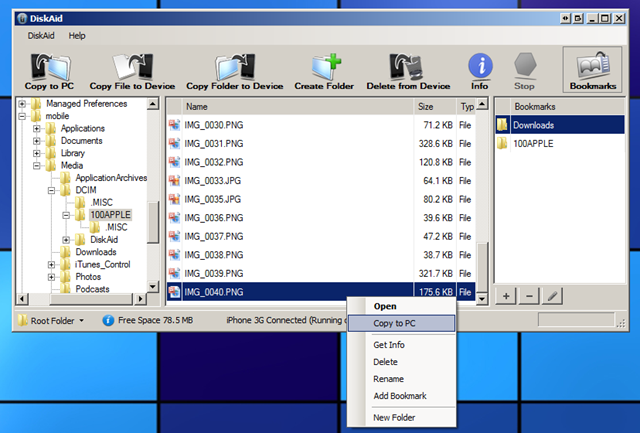 iFunBox allows transferring of multiple files all at once, and very fast! It also does not require installation, extremely green… Thanks a lot Tracy! hi all. i have the same problem now. this morning i synched my iphone. But today i downloaded 150 pics via 3g. But now when i attach the iphoe, itunes sees the iphone, synchronizes it but i cant see iphone as a disk in windows explorer, and i cant move my pics to my pc. btw disk aid, pics aid and ifunbox.exe didnt help. 10 mins back everything was fine. Now both iTunes and windows do not detect my 3g running 3.1.2 and a blackra1n jb. The iPhone doesn’t even charge while docked to my laptops!!! Method 1 didn’t work. Method 2 failed cuz iPhone not detected. Weirdly Wall chargers on the same USB cable are working just fine. Can anyone help out?! Is this a hardware issue cuz I can not reboot my iPhone thanks to the tethered blackra1n jailbreak m running. I have a similar problem (but unfortunately no solution). I just upgraded my iTunes to ver. 10 and my iPhone is 3G. Now the iPhone is not detected as an iPhone in iTunes, and in Explorer I notice the iPhone is detected as a camera?! What can I do?? My intention is to upgrade to a iPhone 4 and coincidentally to a new computer/laptop as well , but I’m afraid I’ll get more headache unless I first resolve the current issue on my current iPhone and current laptop. I had the same problem on Windows 7. I checked in “Devices and Printers” and the Iphone was showing with a sign saying it wasn’t working correcly. So I tried the troubleshooter directly from there and It worked ! It really solves the problem everytime it’s not detected. Talked to Apple Care. They said they changed it so that your phone does not show up like a drive or camera/device. All you have to do is download a program like Picasa or Diskaid. Then you should be right back to normal. Just use the program to download your pics to your computer. Picasa even made my drivers work properly. Laptop(hp vista and MacBook pro) both don’t detect the phone via USB. It doesn’t charge iTunes doesn’t detect. Methods 1&2 didn’t work for me. Soln:-Enter into recovery mode by holding power n home button for few secs,release power button n hold home button. Screen now displays a cable n says connect to iTunes. 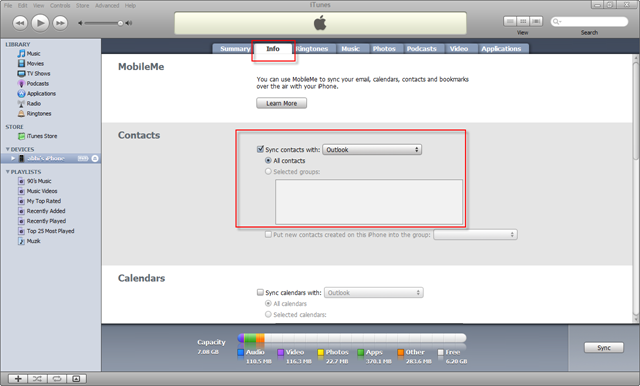 iTunes will now detect n contact apple server to update/restore . At this point u can run ur jb(in my case blackra1n) or update n restore!!! I have the same problem on XP. The device is not recognised at all. Have tried Picasa and Diskaid and neither see the device even though the drivers are all OK. I haven’t restored the device yet as I have 75 photos fow work I need to back up first. Has anyone got any ideas at all? Surely it shouldn’t be this hard to get a photo off of a mobile!!!!!! Restoring to original factory settings is the best way to fix any software issues. You will be in a fix if u intend to unlock and jailbreak after an update as there is no jb n unlock for 4.0.2 firmware yet. I just bought a new laptop with windows 7 64 bit i downloaded i tunes so i could sync my iphone to it my laptop does not recognize my iphone and neither does itunes does anyone know what i can do to fix this. starting from the one you transferred last. At some point it may show up in the Windows explorer. that I get via email. 5. look for “apple mobile device driver” in this life. right click and update. if update fails only then reinstall the driver. below link gives details on update an reinstalling usb driver! good luck! if all else fails and iTunes does detect iphone in “recovery mode” then restore/ update your ios. Felix Page – Your 1/16/10 entry fixed my problem. Thanks! i was trying to follow the steps but my computer is on a japanese txt could you please teach me the short-cut key for this. for example opening file F is being underline. please help! I had this problem, everything else except the iPhone worked fine. After some checking, it was noticed that the 5 Volt line feeding the USB port was nearer to 6 Volts. The problem was with the main PC power supply. The solution was to change to power supply and all was well. It seem the iPhone must check for an over voltage from the USB and if too high then will just not turn on. Modern mother boards do not consume much power on the 5 Volt line and therefore cheaper power supply units (PSU) tend to over-volt a little but should not reach nearly 6 Volts. This can easily be checked with a volt-meter, back off PC, and find a spare ‘chunky’ 4 way connector, normally feeding the hard-drives. Measure the voltage across one of the black wires and the red wire which should be between say 4.5 and 5.5 Volts. Finally got my iPhone 3G to show up in “My Computer” again. I had upgraded to ISO 4.0 on the iphone from itunes. All I had to do was take a picture with the iPhone and plug it back into the computer via the USB cord. And “BOOM” it showed up instantly!!! Thanks for the Help and ALL the input. This worked by the way on Windows Vista. This exactly solved my issue – thank you!! If you have a SD card inserted in your computer (say from a digital camera) remove it, and then plug in your iPhone. That trick for me made my iPhone digital camera pop up in windows explorer again. If your iphone USED TO show up in My Computer and now it doesn’t, perhaps you need to update your Apple mobile device USB driver (go to Device Manager, right click on the driver and tell it to update the driver). In my case the cable was the problem. New cable, happy times. Hey I had this exact problem. I’ve been trying SOOOO hard to fix this without spending money on anything. Sometimes APPLE IPHONE would show up in Portable devices, but most of the time there was no category for Portable devices at all. Alternate Solution: I had the same problem and tried some of the solutions mentioned above, none worked. I installed Ubuntu in my machine and I was able to access all my photos. Thanks so much! I just used Sn0wbreeze 2.0.1 to jailbreak my iphone 3gs and the pictures were not showing up on my camera reel. Yet when i looked at itunes, it showed that space in my iphone’s memory was occupied my photos! I tried the methods you first mentioned but my iphone was not showing up on my computer. Diskaid allowed me to locate the photos that were indeed on my phone and copy them to my laptop. I’m so happy that I didn’t lose almost 600 pictures and videos. hey Disksid worked for me… i really did not know what to do but disksid helped me and specially this website…. thanks a lot….. I have had iPhone 16GB 1.5 yrs just bought several apps from store but computer dies not recognize phone anymore can order, get acct. Info but can’t download what I bought a week ago!! Can’t view my apps on line at all, tried to download on phone told I need to update to 4.1 (?) computer have been updated but computer want accept my phone!!! Where do I begin? Thanks in advance!! Need my apps I purchased! Another solution that worked for me. Go to control panel. Go to uninstall programs. Look for something named libusb, or similar. Uninstall, reboot the computer, and the phone should be detected. Worked for my jb 3G without having to delete and of my downloaded/MMS received photos. (I tried step 2 and it didnt work, but after deleting libusb, it showed up just fine in device manager (previously there was an error)). Followed Megan’s suggestion…worked like a charm. I simply turned my Iphone off while connected to the computer. and turned it back on again! it then showed up. My solution was simple enough. After all the fiddling with finding services, etc. I simply plugged my cable into another USB port on my laptop and hey, presto … my iPhone was once again recognised on My Computer. This is a great article – I was able to fix it by following Mario’s solution. Thanks. Here’s my take, My Iphone wouldn’t show up in ‘my computer’ after I’d set a downloaded ‘photo as lock screen photo. Changed it to one from ‘photo roll (a picture I’d imported, not even one I’d taken) and lo and behold as soon as I plugged it back in it showed up again! Hope this helps too! Hi, I reaaally need help, I just got a new laptop windows 7 64bit, I plug in my iphone, windows and itunes is not able to detect it, I’ve tried everything. And also I do not have apple mobile device in device manager, please help me! OMG thank you so much from the very bottom of my heart. Truly you are my hero. I had 1,663 photos of my newborn baby on my iphone and I could not get them to my computer. You are the absolute best x 1,000 !!!!! For me, the solution turned out to be removing a Logitech Camera Driver. Went to Add/Remove Programs and removed Logitech Camera Driver. Even before the remove was complete, XP detected the iphone4. So much for plug and play … plug and pray … plug and spend your day troubleshooting. It seems evident Apple doesnt do a whole lot of QA on XP systems. Logitech is not exactly a no-name camera manufacturer. Hey, I had the same problem with my iphone 4/windows 7 x64. The iphone would not get recognized (Unknown device in device manager). Also the battery charging icon does not appear when connected thro USB to my laptop (It actually charges though). From wall charger, it charges as usual. Tried installing Apple mobile device drivers, restarted the service, laptop, iphone and everything proved futile. At last I connected my iphone to my office pc running XP SP3. It immediately reckoned my device as a camera. Just disconnected it, took home and plugd in my laptop and WOW it worked. Did not delete any photos from my iphone. Thank you very much, i used your second method and it was like a blessing. disk aid does the trick! Cisco was right with his method, although what it seems to be is if you last photo on your reel is not one taken by your phone i.e. copied from email or something then this prevents it from showing up. No need at all for disk aid. I used Mario solution and from device manager found in Windows 7 that un update DRIVER made the trick. hey everyone i js bought a new jail-breaked iphone with 4.2.1 version, when i connect my phone via usb with my PC which is running on Windows XP i do see the iphone icone in “my computer” (with camera icon) i can transfer images but my iphone does not appear in itunes….WHAT SHOULD I DO PLEASE HELP….tried updating,uninstalling, re-installing all the drivers of iphone through USB controller, service manager, device manager…PLEASE HELP ME OUT HERE….THIS PROBLEM IS REALLY ANNOYING!!! Make sure you have latest version of iTunes, some older versions don’t work with 4.2.1 firmware. purdygirl- taking a picture worked for me as well. Previously Vista recognized the iphone once, then when I removed it and reattached it did not recognize it again. I took a picture, re-attached it and sure enough it recognized the iphone on the PC. Rohit i have the latest version on skype…. some one just told me abt the DFDU driver or something… ny help would be highly appreciated…. Thank You. Cisco’s answer did it for me… nothing else worked!! I didn’t want to download DiskAid so don’t know if that works or not! OMG !!! I loveee you diskaid!! the iphone IS recongnized as being plugged in if i have it enabled under imaging devices, but itunes wont recognize to sync…ive read all the posts above, and still cant seem to find the right answer……PLEASE HELP. I’ve been screwing around with this since the upgrade to iTunes 10. (I have a 3GS) and the phone would show in windows as a camera, but not in iTunes. I would do all the driver updates, uninstall and reinstall intunes, etc. I would sometimes get it to connect, and then the next time I sync’d the same thing. I just read a post someone did that solved my issue. I just disabled the internet on my laptop, and my phone showed up in itunes. I tested if 4 or 5 times, and that’s what it was. If I turned off the wireless connection on my laptop first, my phone showed up. If I turned it back on after it showed up, it stayed connected. thanks CISCO! I made one picture with my cam and it workt! Had the same issue.. tried the trick about unplug, take a new photo, plu & resync and it worked like a charm. I plugged my Iphone into the PC and it charges Via USB but does not show up in MyComputer, So I left it plugged in went into DEVICE MANAGER, Under the USB section I right clicked and Uninstalled the Apple USB driver and re-plugged the phone in and it worked again. omg took a picture and replugged the iphone and it worked! LOL amazing 😀 thanks! any queries feel free to ask…. Yes it works for a while, but then you have to start paying for it, to carry on using it!! Thanks SOOO much for the tip in taking a new pic! Worked perfectly! I am currently uploading my pics 😀 YAY!!!!!!!!! Neither my iPhone 4 nor my Zune would connect with my Windows 7 64-bit machine… and have been scouring the internet for ideas for days. NOTE: A “The command completed successfully” message should appear. 6. Close the command prompt and reconnect (device). I’ve tried everything from Apple Tech Support, reinstalling drivers and iTunes, installed diskaid, no luck, until I found your post. I have a really bad habit of saving random pics I find on funny websites, in emails, or texts. Deleting all of them, or worse, sending them a few at a time to my email to back them up did not sound fun to me. Took Francisco’s advice, I disconnected iPhone from my PC, took a picture of my keyboard, plugged it back into the PC while iPhone was in photo album, and it showed up as removable storage. Yes…DiskAid worked for me too. Mine is Windows 7, 64bit and iPhone 4 with latest OS as of 4/25/2011. I also purchased for $9.90 immediately. THANX DUDE…. SECOND METHOD WORKED FOR MEEE !!! I need help with my iPhone I got it a week ago and I am trying to add music to it from my computer and iTunes won’t recognize it why shud I do? deleting dloaded photos worked! whew! twas magic. thank you!!! Thanks a lot Cisco…worked for me..
and thanks Rohit for the post..
prior to plugging in your Iphone to your PC insure that it is unlocked. PC’s wont import photo’s from a locked phone. Uninstalling the USB driver and then re-installing it did the trick. Thanks! Mario Thank you very much. Hey guys the 2nd one worked for me…. Thank you…thank you…thank you. Thought I would never get my photos off my iPhone but with DiskAid and FileApp I can now enjoy my pictures on my PC. Nothing worked for me permanently until I combined 2 suggested solutions. 10) Plug back in go to My computer on your desktop and presto. There is your missing Iphone !!! Tried everything for hours to download holiday pictures – iphone 4 not even recognised by XP PC. Tried option 2 but could not find the ‘Apple iPhone’ in ‘Devise Manager’ until I read Pat’s answer on April 20th 2010. Thanks Pat – worked a treat. I have lost my phone the other day. I do Have mobile me to locate it.Is there a way to locate it by any other means. I have been trying to locate it with locate my phone Mobile me and it says it was not located. Can GPS find it if turned off? Please help if at all possible. I was up to option three a few days ago when I disconnected my iPhone and reconnected it. My computer didn’t change until I touched my phone again and got hit with static. It immediately connected to the PC and worked nicely. Tried it again yesterday and had the same problem until once again I got zapped by it. Could a build up of static make it fail? I dunno, but its fixed mine a couple of times. My iPhone 1.1.4 is charging but do not show the indication. iPhone is not detected on iTunes. I tried every thing. Also not recognized in recovery mode on iTunes. Thank you guys…it even worked for windows vista…my iphone didn’t show up in my computer…i removed my iphone, took a pic, and inserted it in the drive…whoa! i saw the device in my computer. now it’s easy for me to import pics…yehey!!! OH MY GOSH!!! FINNALY!!! SOMEBODY THAT KNEW WHAT THEY WERE TALKING ABOUT WHEN IT COMES TO THIS PROBLEM. THIS WEBSITE IS LAME. NOT A SINGLE OPTION WORKED, AND I DIDN’T WANT TO DOWNLOAD THE PROGRAM THAT THIS WEBSITE WAS JUST TRYING TO PROMOTE!!! All you have to do is delete the photos that you DID NOT take with your iphone but imported somewhere else, like the internet or other phone. That’s it!!! Thanks Cisco!!! We all owe you. im using 3g iphone ios 3.1.2 after jailbreak and upgraded this ios im facing a serious trouble with my phone.. itunes doesnot reconized to no computers i have tried with macbook pro ,windows 7,windows xp.. also it has been battery drain!!! how to restore or how to fix it? is anybody pls tell me with details… with final solution will help lot of peoples..!!!! What about if i have a passcode on my Iphone. Cause i do try with diskaid, the answer is taht i have to use a passcode first. But i don’t remember the passcode and my iphone is in disable mode, i don’t want to loose my data. Thanks a lot! actually Diskaid worked for me ! Great tool to transfer pictures where your device can’t be read anywhere. THANK YOU. Deleting off photos not taken by my phone worked straightaway for me – thanks for the tip Cisco! If there are no photos in your camera roll then it will not show up in my computer. Take a photo, reconnect and it will appear. THank u very very much. I’ve been trying to solve the sam problem for last few days and your article saved me!!!! Greetings from Croatia! If the pictures folder is empty, Windows has a hard time finding the device. Disconnect. Take a picture with the iPhone. Reconnect. Method 2 here worked for me. Device Manager->Imaging Devices->Apple iPhone->Uninstall. Made sure phone was not plugged in at time. All 100+ photos/videos etc were taken with phone. I hadn’t noticed this until the most recent update. Talk about annoying. ARMAND….you are a genius…..I have been tearing my hair out for months wondering how to solve this problem and after trying a couple of solutions on here to no avail your sugestion was the only one that worked even though was for windows 7 it works on windows vista which is what I have…..thank you so much!! Does this solution applies to transferring songs? Thanks a lot! The tird option has worked for me too. The second option showed me that the installation of Digital Still Camera driver (that iPhone’s tries to install) is not completing correctly on my pc. I have tried all of the above. What seems to be my issue is photos that were sync’d from my PC that show up in albums called “photo library” and “pictures” but not in ‘camera roll”. I can find no way to remove them since they were sync’d via iTunes. I have Win7, latest iTunes 10 (uninstalled/reinstalled) and a 3GS with 5.0.1 on it. When I connect my phone it will not recognize it at the Win7 level or iTunes. Latest pic is one I just took of my keyboard, there are under 100 pics on the phone, DiskAid and iFunBox don’t recognize it, it does not show up in iTunes at all. I can’t find anything so far to fix this thing. It says when I connect it that there is a device error on both Win7 and WinXPsp3. Ideas? Thanks. bottom line is that microsoft and apple does not mix period. I’m a very busy real estate agent trying to get this fixed for 3 weeks now and nobody can help me. And this one worked for me! Good job! Thanks buddy, the 2nd solution.. uninstalling the device and connecting it again worked for me. This was a bit more helpful than the other sites I’ve tried. I’ll try DiskAid if I have to, but I really want to sync my iPhone w/ iTunes again. Method #2 didn’t work for me since I didn’t even see “Portable Devices” in Device Manager — I have win xp w/ sp3. The iPhone is not recognized by windows or iTunes. The only thing it’ll do is charge. My Iphone 2s is not working now it is showing itunes and usb Symbol and not allowing me to go for mail screen. This happned when i updat new itunes . please some one help me in this. @Mario, it worked as you said. Woohoo! I didn’t have to do step 9. It first showed up as the “Unknown MTP device” but then after about 15 seconds it disappeared and then “Apple iPhone” appeared. Two things that should be mentioned. a) some steps require 10-20 seconds of waiting while re-scanning or Windows re-finding your iPhone. Be patient with each step. b) Restart whatever application (e.g. Picasa) you were using so that it finds your iPhone after you rediscover. it works!!! Thank a ton!!! people like u make this world a better/easier place to live in !!! I did what Megan said: I turned the iPhone off while it was plugged into the computer, and then turned it back on, and the computer discovered the iPhone. I have Windows 7 and an iPhone 4.
thankz men……its a big help…..
On my laptop I see my iPhone and can drill down to the pictures. The problem is when I plug my iPhone into my PC running windows 7, it see’s the phone and opens in windows explorer but when I drill down to the pics folder there is nothing there. I do the same on my laptop and another windows 7 PC and I see them. Any ideas? Connect via USB data cable to Windows 7 Ultimate x64 desktop. Windows recognizes device and phone would charge. iPhone would be displayed under “Computer” however it would have a different icon. I would be able to drill down as far as DCIM and then that folder would show as empty. While troubleshooting this issue I noted that the Apple Mobile Device service will only be present if you have iTunes installed. On my desktop I was using the default driver that Windows 7 installs. I had tried uninstalling that driver under portable devices in device manager and then scanning for hardware and reinstalling the driver to no avail. I had also uninstalled USB composite device drivers and USB root hub drivers just to try, also to no avail. Finally I downloaded and installed iTunes. Plugged in my iPhone and under “Computer” I could drill down into the DCIM folder and have all my photos displayed. It now shows the iPhone icon under “Computer”. I then uninstalled iTunes (I don’t use it for anything) and rebooted my system and issue continues to be resolved. I’ve tried a whole bunch of websites’ recommendations, everything on this page, and what Cisco said, and NONE of them worked. Thanks you!! I had the USB port working fine with IPhone 3, but it would not work with IPhone 4. It would not charge nor would ITunes recognize it. Finally after reading your suggestions I updated the USB driver and it worked fine!! Im using 3g iphone ios 3.1.2 after jailbreak with redsnow 0.9.4 im facing a serious trouble with my phone.. itunes doesnot reconized to no computers i m using vista. nt dis disk aid helps it keeps on saying looking for iphone, ipad,ipod, …..plz plug it in, device manager, services nothing is showing apple iphone, Also it has been battery drain!!! how to restore or how to fix it? is anybody pls tell me with details… with final solution will help lot of peoples..!!!! Thanks brother … solved here! The removal of photos not taken by my iPhone worked for me. My problem is I just bought an iphone 3g in bad condition for 20 buck from a friend. I plug it into my computer and its not found on the computer. (but it does charge) I tried the diskaid and it didn’t work. method one didn’t work and the problem with method two is that in device manager there was no > Portable devices category at all. Pleas help Thanks! Uninstalling portable device in Device manager was sollution for me! None of the above worked on my PC. I should have got an Android! Apple products even read Androids…much better! Arggggghhh! I was reading through all the steps and nothing was working. I finally downloaded itunes and suddenly my computer can read my phone. Seems kind of fishy but whatever. If that is what I need for my windows 7 netbook to read my phone, then so be it! Woop, woop!!! Thank you, thank you, thank you!!!! DiskAid worked magic!!!! Just did a iphone reboot and it worked for me..
Megan (posted Jan 15th 2010) You’re a star! Couldn’t compete methods 1 or 2 as nothing showed up and was contemplating dowloading DiskAid when I tried your suggestion – simply turning i-phone off and back on whilst connected to PC (windows 7, no i-tunes running). Whooppee!! Worked straight away! You’re brilliant! THANKS!!!!! I have a 3G iPhone, and after a sync, my pictures didn’t show up and my iPhone wasn’t listed in my computer. I turned bluetooth off on my iphone and then reconnected the USB cable. It appeared as a storage device as usual. I can’t have bluetooth on and the cable connected at the same time. Hope that helps! I managed to fix this problem by opening the device manager and plugging in the device. the computer recognized the hardware but said there was a problem with the driver then I went to > Universal serial bus controllers > apple mobile device USB driver > update drivers. It worked!!! these methots couldn’t solve my prblem……. None worked for me so then I tried the Usb cable that came with the phone instead of the usual one I used. Worked perfect. Thank you very much. To the point and successful. My iPhone 4 mysteriously stopped allowing me to download pictures to my PC. Tried all the administrators tools, no avail. Uninstalled driver, etc. But DiskAid worked, thank you for sharing your expertise. Bravo. 1. With the iPhone disconnected from the computer, Open Start Menu >> Run >> and type services.msc and press ok or hit enter/return. * note (a): this will open up the “services” window with all programs running in the background. * note (b): if you do not see “Run” under the Start Menu, use the “Search programs and files” search box (for windows 7 users). 3. Double click on “Apple Mobile Device” to open it or right click on it and choose properties. * note: the “Apple Mobile Device Properties (local Computer)” window will now be opened. 4. Under the “General” tab you will see “Service status:” listed on the bottom half of the window, along with a Start, Stop, Pause, and Resume button. 5. Click on the “Stop” button to stop the service from running. 6. Connect the iPhone to the computer via the usb cable. * note: the iPhone drivers should then successfully be installed, as it did on my computer. At this point, the auto run window should pop-up as the iPhone is now connected to computer. 7. After the iPhone drivers are installed, click on the “Start” button within the “Apple Mobile Device Properties” window to restart the service, then click “ok” to close the window. * note: iTunes will need to be restarted if running in order for the iPhone to be detected. 8. That’s it. Hope this works for someone else out there. While diskaid is the solution for me, I would like to ask if just copying the pictures and videos over will change the actual sizes and resolutions taken by the phone? Will it reduce them? SORRY FOR ALL CAPS: but wanted to make sure you saw Cisco’s tip above. It works like a charm. Great ! DiskAid worked for me 🙂 Thanks a ton. That fixed it! (Uninstalling iPhone in Device Manager) I had to plug the phone into the computer before I saw the setting though! Thanks a lot. I’ve tried sometime to figure out the problem, but nothing works. However, your second method works for me like a magic. Many thanks for sharing this with us. God bless you! The second method worked for me. 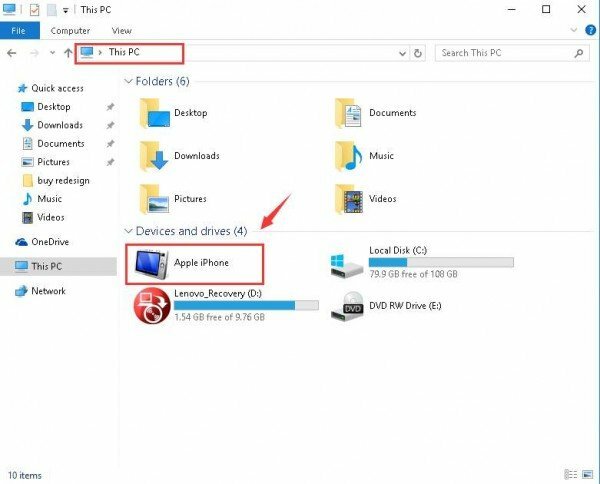 Under Device Manager – iPhone is visible under ‘Others’. Uninstall it and plug-in the iPhone, it should work. Also make sure you have the iTunes installed. Wow. This was crazy. I spent the last 8 hours trying to get my iPhone 3GS to be recognized by Windows 7 32-bit. I had tried everything I could find on the net. All the services (Bonjour, iPod Service, etc.) were all running. Could not get Windows 7 OR iTunes to recognize it. Then I saw a post above….May 13, 2010 by Francisco. Windows 7 only recognized my iPhone in Device Manager as a Bluetooth Peripheral, but had no driver for it. The listing was under “Other devices” with a yellow exclamation point. I finally figured out I had to download Microsoft Mobile Device Support driver package to solve that. Once I installed my package (32-bit), the listing under “Other devices” disappeared, and under Bluetooth Radios a new listing showed up called “Windows mobile-based device support”. But My Computer and iTunes STILL would not recognize my iPhone. Then I remembered earlier in the evening, Windows had recognized it and I had downloaded 3 photos and 1 video to my desktop, leaving it with no photos. That was when my computer would not recognize it anymore. Then I went nuts for 8 hours trying to get Windows and iTunes to recognize it. So what I did was take some photos with my iPhone, and suddenly my iPhone was listed in My Computer, and under Device Manager it is now listed under “Portable Devices” as “Apple iPhone”. At the moment, iTunes still does not recognize my iPhone, but at least I got Windows to recognize it thanks to Francsisco’s post from 2 years ago. THANKS CISCO YOU ROCK!!! I have spent months trying to find a soultion! Method 2 worked for me. Disk aid worked! And once i’d used disk aid to delete a few photos, it then appeared in my computer! thanks! The second method worked perfectly on my iphone 4s. YES! The DiskAid worked. I can finally download my pictures from my iPhone. Thanks so much! Thanks! It was exactly what I needed it. Thanks Again! hiyo. dude that worked. thanks a bunch. Best and simplest ways I’ve ever seen ..Thanx a lot..
Hi Cisco,i followed your process but in my case iphone is detected in my PC not and not iTunes,so now i have no idea how i will be able to transfer my photos from the pc to iphone. You are FANTASTIC. Went through a restore, horribly messed up iphone, HOURS of support with Apple to get the phone back to the same semi-broken condition (settings and contacts once again intact except can’t get my pictures off of it) until they realized it was not an iTunes Problem. It was an autoplay problem, but I didn’t know that was a windows function, not an Apple function. They cannot not support Windows or tell you what to do. Probably 3 or 4 hours chasing ghosts, though I did switch to iCloud in the process so it was probably worth it. Tried a couple of different FAQs, no luck. Your removing the Apple Portable Device Driver, rehooking up the phone did the trick. THANK YOU SO VERY MUCH!!!!! The iPhone showed up before I deleted all pictures from the Camera roll. I tried everything all the other commenters suggested until I got to the one about putting at least one picture in the camera roll. Then, success!!! I was a little hesitant to uninstall the iPhone. Glad I did. I can now transfer my pictures from my iPhone to my pc. Thanks so much for the info! Thanks Cisco! I tried deleting just the photos that I knew weren’t taken by my phone, and still it wouldn’t show up. So I got Disk-Aid and got my pics off first, then deleted all of them from my Camera Roll. After that Bob’s your Uncle. Thanks again cisco! I’m sending a copy of this page to the Apple advisor that was trying to help me through this problem. Hi! Disk Aid did it for me good job mate. Thanks for the replies on this site Pics Aid did it for me, very easy to use. I am having the exact same problem with my iphone being recognized in iTunes but not on my computer. I tried following your instructions, but after doing “run” – in the “services.msc” list – there was no such listing as “mobile device driver” – do I need to install this first? thnx very mch…DiskAid has done the trick for me.. Thank you cisco. You made my day!!!!!!! You are right. There has to be at least 1 picture left on the camera roll. This was driving me crazy. Once I took one picture I was backm in business and my Iphone 4S showed up under My Computer. Deleting apple from device manager and replug back has fixed my issue! Thank You SOOOOOOOOOOOOO Much!! I Had This Problem And It Was Driving Me MAD!!!!!!! The 1st Solution Worked For Me. Once more, thank you Cisco, solved! DiskAid actually works really well. I didn’t want to go back through the thousands of pictures I had from emails and other apps so I tried the DiskAid route and it worked just as advertised! Thanks a TON! I would have thought there would have been a better solution to this by now! Just off your phone, unplug, on the phone, plug back in. TAA-DAA. Wow! BIG THANKS! Method 2 worked for me! Good lord, this is STILL an issue! Cisco’s advice worked (can you believe something you said 3 yrs ago is still helping people out?) Wouldn’t recognize my photos because I had a screenshot in there! Once I deleted it, problem solved. I have tried everything. I have a iPhone 4S. Just a month or so ago I could connect it to my computer, and everything was fine. The PC recognized it, charged it, allowed me to pull data off of it – no problem. Then suddenly it just stopped. I plug it in now, it doesn’t recognize it, doesn’t charge it, even iTunes is no help – and yes, I have the latest version. I tried everything I saw above. Nothing works. Someone please help. Under Device Manager the Apple Mobile Device USB Driver has that yellow exclamation point. When I tell it to update, it says it has the latest software. I tried disabling and re-enabling it. Nothing. I tried uninstalling that, unplugging and re-plugging the phone, and it then says “Device driver software was not successfully installed” – and the yellow exclamation point is still there. This makes no sense. Why would it work fine then suddenly just not work anymore? Someone please help me before I pull all of my hair out. great! a big thanks! this works a lot for me!!!! Hey guys, to get this to work, you have to have your iphone unlocked before plugging it into your computer. Enter your passcode to unlock your phone then plug it in and it should recognize it. I still have this problem. As advised using DiskAid. Looks good alternative solution. Thank you. The device manager uninstall solvedy problem. I am using a Windows 7, when i connect my iphone to the usb, at the beginning a dialogue box pops up saying “One of the USb devices attached to this computer has malfunctioned, and Windows does not recognize it” and the iphone didnt charge, furthermore it is not charging through the socket unless I switch it off. Now when connected to any USB of any computer, nothing happen, it is not being read at all. I found another solution in a portuguese tutorial that worked perfectly for me. I’ll put it here for the people that this tutorial couldn’t help. I’ll do my best to say the correct names since my iTunes is in portuguese as well. 2. Go to ‘Devices’ and then click ‘Reset Sync History’. Don’t worry, this will not affect anything in your iPhone neither will it delete your files. 3. Unplug your iPhone from your computer and plug it in again. Excellent, i only had to delete couple of videos on my iphone and re-plug to windows 7 and its there. thx. I used Disk Aid and it worked for me. thank u so much. Thanks a lot, the third option (Disk Aid) was the only proper response I have had after a long time. Thanks a lot.. method #2 solved it!!! Your iPhone should show up there and may have an exclamation mark (!) on it. The computer will check updates on drivers etc. Once this has completed, the exclamation mark should have disappeared and the iPhone should now be on Explorer!